Limping in a child is a concern. 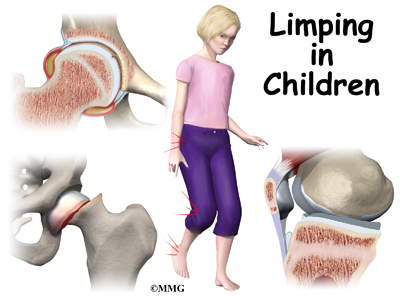 Limping in a child is never normal. It can be caused by many things, sometimes by something minor, like a blister or cut. The most common cause of a limp in young children is a fracture. Sometimes it is caused by a serious infection. Although rare, it can be caused by a tumor. What parts of the body can be involved? Sources of limping can involve many parts of the body. The hip, knee, shin bone, ankle, and foot are common parts that can cause limping. Limping can also be caused by problems in the back or pelvis. The hip is a ball-and-socket joint. It is covered by a tough lining called the synovium. The ball of the joint is the end of the thigh bone, called the femur. 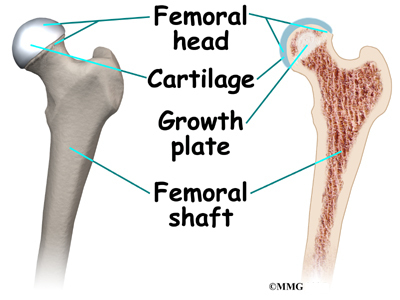 Like other ends of bones in children, the ball has an area called a growth plate. A growth plate has cells that produce new bone. The growth plate is weaker than other parts of the bone. This makes this area more likely to fracture. The socket part of the hip joint is called the acetabulum. It is actually part of the pelvis. The acetabulum forms a cup where the ball of the femur sits. It is covered with articular cartilage. Articular cartilage is the material that covers the ends of the bone of any joint. It's a rubbery, slippery substance that allows the surfaces to slide against one another without damage to either surface. The knee joint is made up of the other end of the femur and the end of the shin bone. 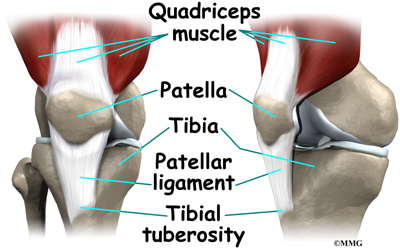 The knee cap, or patella, also is part of the knee joint. In children, pain in the knee can actually be caused by a problem in the hip. The lower leg is made up of two main bones. The larger bone is the shin bone, called the tibia. The smaller bone runs along the outside of the tibia it's called the fibula. These bones, along with a saddle shaped bone at the top of the foot called the talus form the ankle. The foot has many bones. There are short bones below the ankle towards the back of the foot called the cuboids. The long bones of the foot from the arch to the joints of the toes are called the metatarsals. How can this condition develop? The most common cause of a limp in small children is a fracture. Toddlerâs fractures involve buckling or bowing of the tibia (shin bone). This usually happens when a child trips or falls up stairs. Bunk-bed fractures are caused by jumping. 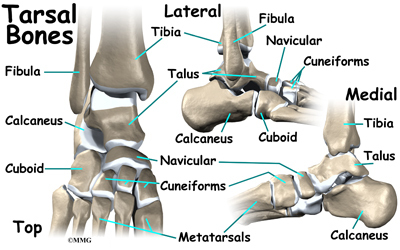 The cuboid bone and first metatarsal in the foot are the bones that are usually broken in this type of injury. In children from two to ten years old, the most common cause of hip pain is transient synovitis (TS). This involves swelling or inflammation of the synovium of the hip. The synovium is a tough covering of the joint. Often, the child will have had a cold or viral infection just before the hip pain started. Transient synovitis usually lasts ten days. It generally gets better on its own. Joint infection of the hip causes a more sudden onset of pain. Children will usually not walk at all when the joint is infected. Osteomyelitis is an infection of the bone. It usually happens near the ends of the bones, close to the growth plate. Overuse syndromes are common in active adolescents. Stress fractures of the foot, patellofemoral joint problems, and [imagelink href="http://www.eorthopod.com/images/ContentImages/child/child_limp/child_limp_osgood_schlatter.jpg"]Osgood-Schlatterâs[/imagelink] disease are examples of overuse syndromes. [imagelink href="http://www.eorthopod.com/images/ContentImages/child/child_limp/child_limp_perthes.jpg"]Legg-CalvÃ©-Perthes disease[/imagelink] typically affects boys between the ages of five and ten. It is also called osteonecrosis and avascular necrosis of the hip. It literally means death of bone. The ball of the hip dies because the blood supply has been cut off. When this happens, the femoral head and acetabulum will change their shapes over one to three years. The ball of the femur will flatten out. This problem with the hip is often missed at first. It is frequently misdiagnosed as synovitis of the hip. Slipped Capital Femoral Epiphysis is the slipping of the growth plate of the ball of the hip joint. It usually happens in obese, older children. Tumors in bone are rare in children. Ewingâs sarcoma is a cancerous tumor that starts in the bone. More often, a tumor found in the bone is from cancer somewhere else in the body. Neuroblastoma and leukemia are both known to cause destruction of bones. Rheumatoid arthritis is an auto-immune disease. It can affect children. When it does it is called juvenile onset rheumatoid arthritis. When left untreated it can destroy the synovium of joints, causing deformity, pain, and loss of mobility. Neuromuscular disease such as muscular dystrophy or other genetic problems may also cause limping. Back problems, appendicitis, or other problems in the abdomen or pelvis can cause limping, usually in older children. In addition to limping, or not walking at all, other symptoms may occur. Swelling or redness near a joint often means infection or inflammation. Fever or chills can also mean infection. Tenderness of a specific area could be suspicious for a fracture. Transient synovitis often happens after having a cold or viral infection. How will your doctor diagnose the condition? Making a diagnosis can be difficult. It is not surprising that it can require more than one evaluation by more than one doctor. In many cases, laboratory testing and imaging tests (x-rays) are needed to make the right diagnosis. Your childâs doctor will want to do a thorough history and physical examination. It is important to know whether or not the limping started suddenly. It is important to determine if there has been an accident or fall. Repetitive or strenuous activity may also be the cause of limping. Your doctor will want to know if your child has had any recent illness, such as a cold, or strep throat. Your childâs doctor will want to look at your childâs skin and joints. He/She is looking for things such as cuts, blisters, rash, insect bites, joint swelling and deformity of bones. Range of motion of the joints may also be evaluated. Since fractures are the most common cause of limping in children, x-rays are done in most cases. In young children, x-rays of the pelvis, hips, and lower legs are recommended. Magnetic resonance imaging (MRI) allows your doctor to look at slices of the area in question. The MRI machine uses magnetic waves, not x-rays, to show the soft tissues of the body. It is best at evaluating soft-tissue injury and tumors. The test may require the use of dye in an IV. Children may need to have sedation or anesthesia in order to lie still for the test. Computed tomography (CT) scan may be ordered. It is best for evaluating problems with bones. It is usually tolerated by children, however, it exposes them to radiation. Bone scans, also called nuclear scans can be used to detect fractures, osteomyelitis, and Legg-CalvÃ©-Perthes disease. A radioactive tracer, Technetium, is injected into your childâs vein. Where there is an increase in metabolic activity, such as in the case with inflammation, fracture, infection, or tumor, the Technetium will be more concentrated. Ultrasound is another form of imaging that may be used. It uses sound waves to create a picture. Ultrasound of the hip can show osteomyelitis, septic arthritis, transient synovitis, and Legg-CalvÃ©-Perthes disease. Laboratory studies may help your childâs doctor make a diagnosis. Most common is a complete blood count (CBC). This checks the white blood cell count which can increase during an infection. When inflammation and infection are present, your erythrocyte sedimentation rate (ESR) and C-reactive protein increase, these lab tests may also be done. Other lab tests may be done, such as rheumatoid factor, sickle cell tests, and lyme disease tests. If joint or bone infection is suspected, blood cultures can be helpful. Your childâs doctor will likely want the joint aspirated. The bone may need to have a biopsy. A needle is placed in the joint or bone, and some of the fluid is removed and tested. In the case of infection, the bacteria causing the infection can be determined and an appropriate antibiotic treatment can then be chosen. Most of the causes of limping can be treated without surgery. Most children respond well to therapy and resume walking normally without any long-term problems. In toddlerâs fractures and bunk-bed fractures, sometimes casts must be used. Limiting weight bearing when walking may mean your child will have to use crutches, or be in a wheelchair for awhile. Overuse syndromes require rest from activity. Stress fractures and Osgood-Schlatterâs usually respond well to a discontinuation of the activity that caused them. Exercises like swimming and exercise biking are usually encouraged to maintain conditioning. Patellofemoral joint problems usually respond to physical therapy, taping, and bracing. Transient synovitis usually responds to anti-inflammatory medication and rest. Symptoms generally improve after 10 days, with an eventual return to activity. In the case of infection, six weeks of intravenous (IV) antibiotics is usually required. Sometimes antibiotics taken by mouth can be effective instead of such a long period of IV antibiotics. Your child may need to be in the hospital for a few days at first. Sometimes surgery is necessary to drain the area that is infected. Referral to a doctor who specializes in arthritis will be necessary if your child is diagnosed with rheumatoid arthritis. Although tumors are rare in children, they do occur. Some tumors may respond to chemotherapy or radiation. Sometimes the tumor has to be surgically removed. Surgical treatment is specific to the cause of the problem. In the case of slipped capital femoral epiphysis, surgery is often required. The femur can be pinned through the skin (percutaneous pinning). The surgeon may need to open the joint to place pins in it. Sometimes the hip that is not affected is also pinned because it is also likely to slip. Legg-Calve-Perthes often requires surgery to shape the hip joint. Tumors are rare in children but they do occur. Your child will probably be referred to a specialist to determine the best method of treatment for the type of tumor discovered. Some tumors respond to chemotherapy or radiation. Surgical excision (removal) may be necessary. Osteomyelitis sometimes requires a surgeon to open the area. This allows drainage of the infectious fluid and removal of damaged tissue and bone if needed. Depending on the cause of limping, physical therapy may be recommended. Range of motion exercises may be given to you by a physical therapist to do with your child in the home. Conditioning programs for older children can allow activity without making the problem worse. Taping, bracing, the use of modalities such as heat or cold, and anti-inflammatories can also benefit some causes of limping. Your childâs doctor will want to follow up periodically. Sometimes this requires repeat blood work and/or imaging studies. The particular type of surgical procedure required will have rehabilitation guidelines specific to that surgery. Your healthcare providers will talk with you and your child about what to expect during the rehabilitation process. After a period of immobility, your childâs surgeon will likely prescribe physical therapy. The physical therapist will work on walking, range of motion, and strengthening. Periodic follow-up will be necessary. This will probably include the need for repeat imaging and lab tests.